Welcome to the worlds greatest guide to Women's Madras Shirts. Are you actually looking for Women's Madras Shirts? Well, we hope you are because the reality is that you have found our Women's Madras Shirts page. Apparel Search is a leading guide to fashion, style, clothing, glam and all things relevant to apparel. 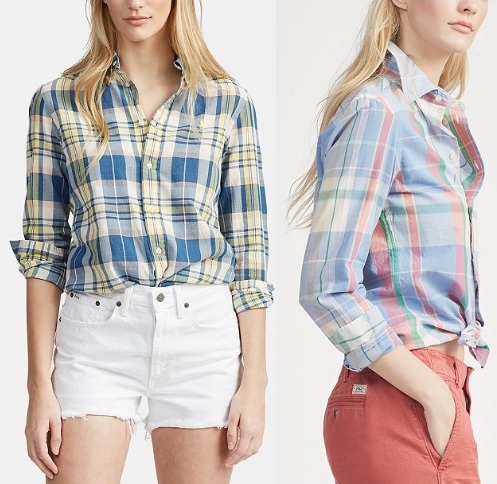 We hope that you find this Women's Madras Shirts page to be helpful. Madras fabric has a check pattern of modified stripes consisting of crossed horizontal and vertical lines forming squares. Women's madras pants can be either long or short pants produced with madras fabric. Madras is a strong, fine-textured cotton fabric, typically patterned with colorful stripes or checks. Madras today is available as plaid patterns in regular cotton, seersucker and as patchwork madras, meaning cutting several madras plaid fabrics into squares or rectangles and sewing them back together to form a mixed pattern of various plaids. Authentic Indian Madras is completely hand woven from yarns dyed with native vegetable colorings. Home-spun by native weavers, no two plaids are exactly the same. When washed with mild soap in warm water, they are guaranteed to bleed and blend together into distinctively muted and subdued colorings. A shirt is a cloth garment for the upper body typically covering from the neck to the waist. However, their are a wide assortment of shirt lengths & styles. Learn about the many different types of shirts in our fashion terminology section. Many different types of shirts can be produced using madras fabric. What ever you are wearing today, is in fashion. If you want to be even more stylish, you should wear your favorite ladies madras shirt. Return to the top of this Madras Shirts page.